Some miles have passed, and some time. One state fell away over the horizon and another surfaced ahead. 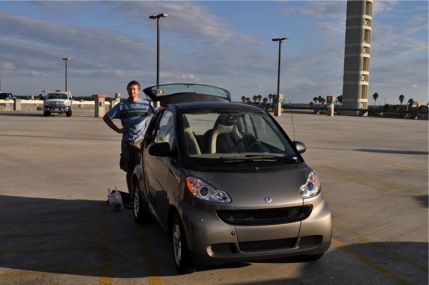 Lee, Pirat and I are in Florida now. The temperatures are in the 70’s. The water is blue and clear. Only one port stands between us and the Bahamas. I can’t believe we’re here! Florida is a little bit like I expected it to be a little bit of a surprise. The weather is tropical and reminds be a lit of Hawaii but the state isn’t filled with old-folks homes and golf courses. Beautiful, natural scenery abounds and friendly, ocean-oriented people are everywhere. The Port Canaveral Yacht Club, where Pirat stayed while Lee and I visited Disney world, is a great little club that is very friendly to cruisers. It reminded me a lot of Ventura Yacht club in attitude and appearance. Everyone was laid back and friendly. There were lots of live-aboard cruisers on the dock and Lee and I hit the jackpot of local knowledge. 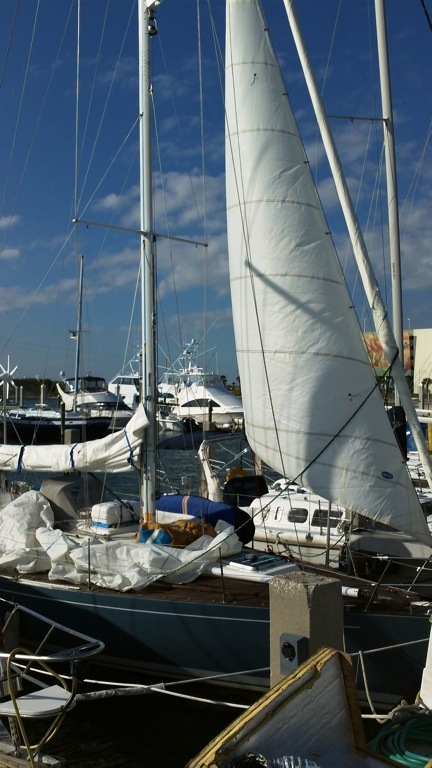 We got tons of great advice on sailing to the Bahamas and beyond. The club members were as excited as we are about our trip. Lee and I spent one rainy day in Orlando and another, sunny day at Disney world this week. 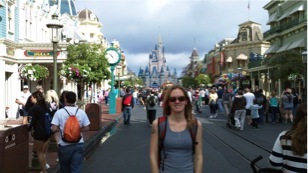 We stuck to one park – the Magic Kingdom – and had a blast on all the rides and attractions. I made Lee go on the Teacups with me and he enjoyed spinning our teacup as fast as humanly possible. 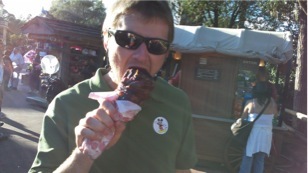 Lee got the giant turkey leg he’d been looking forward to and I got the Disney world visit I’ve been wanting for years! After a day of serious provisioning in our rental Smart Car (yes, it held us and our groceries) and serious laundry at PCYC, we set sail for Fort Pierce yesterday morning. Pirat covered the 60 some miles mostly under engine power. We had just enough wind to sail for a while in the afternoon. It was a calm, relaxing passage except for my mild seasickness throughout the day. Our first encounter with Florida dolphins was memorable. A handful of them swam along with Pirat yesterday morning. They were huge – the biggest dolphins I’ve ever seen! I stretched out on the bow, watching them play in the wake and occasionally turn sideways like they were trying to look at me. Since then we’ve seen dolphins everywhere, including in the anchorage where we are now. We also saw some giant fish jumping out of the water a fair distance away from us yesterday. Whatever they were, something big was chasing them! We waited out some rain in Fort Pierce today but tomorrow we’re off to Lake Worth (near Palm Beach), our last stop in Florida before we cross the Gulf stream to the Bahamas. Ahhhhh! I can’t believe we’ll be out of the country by the end of the month! There are still a few things to do before we’re ready to go. 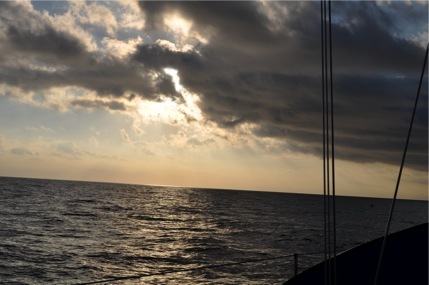 We want to leave with as many supplies as possible and we’ll need a good weather window for the crossing. Once we’re in the Bahamas it’s time for blue waters, desert islands, and new experiences! Wow! Florida sounds like fun. What a contrast to Seattle. 2011 is off to a great start for you and Lee. I’m picking up the wedding invites tomorrow. How long does the trip across the Gulf stream take? And any dolphin pictures for us? Yep, god speed for sure! It should take about 24 hours or a little less to get from the coast of Florida, across the gulf stream, and to some kind of island on the other side.